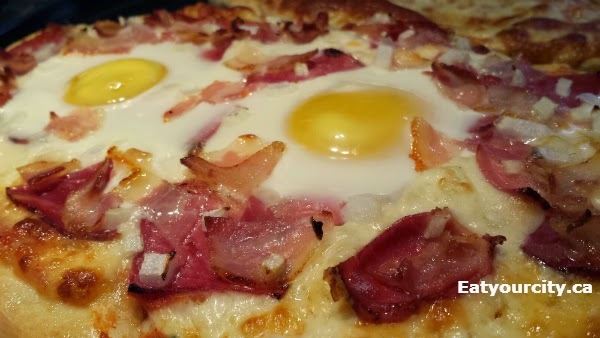 Eat Your City: Weekend breakfast brunch thin crust pizza with eggs, capicollo, pancetta, mozzarella cheese and sweet onions! 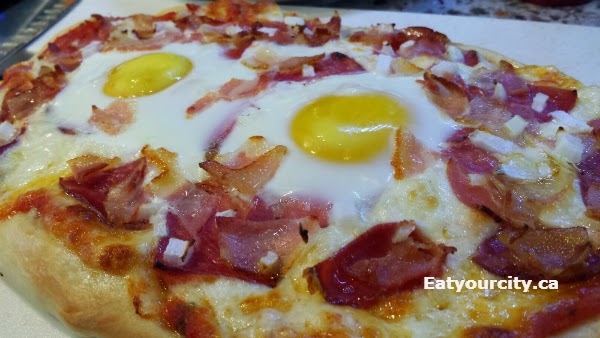 Weekend breakfast brunch thin crust pizza with eggs, capicollo, pancetta, mozzarella cheese and sweet onions! I was lazy and rather than making scratch pizza dough (I already made a quick and easy scratch roasted tomato sauce recipe, click here for the recipe), so I bought freshly frozen pizza doughballs from Italian Market the night before and defrosted them in the fridge overnight. You can use store bought pizza dough, flat bread of even pita bread works in a pinch! 1) If using fresh/defrosted pizza dough, with clean hands, stretch it out into either a round or oval-ish shape, working in a circular fashion around the edges. Toss into the air at your own risk - folks will fall over laughing if you toss it hard enough to stick to the ceiling. Try to make your dough even in thickness but don't stress too much about it if it looks weird - its not meant to be perfect, and you can always mush it back into a ball and try again. 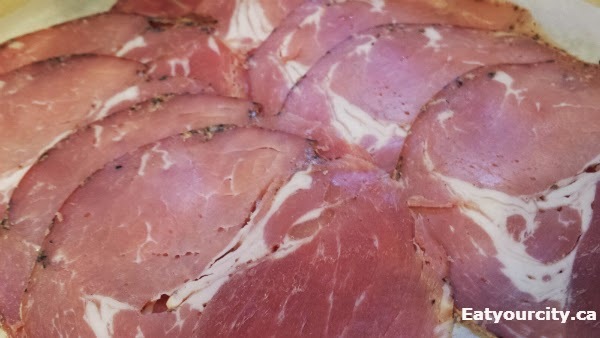 If it gets sticky, lightly grease your hands with olive oil. 3) Top with cheese.. yum! I kinda over cheesed this pizza, oh well! 7) Dig into your very own awesome weekend brunch pizza!